Last week the family and friends of Kevin and John McDiarmid came to the Skiff Club to celebrate their lives in memory of their passionate involvement with the Club in their younger years. Current Club Commodore Phil West attended to represent the Club and accepted as a gift a photo and trophy. Please see below a letter and pictures from Annette Worden and Pam Parsons. 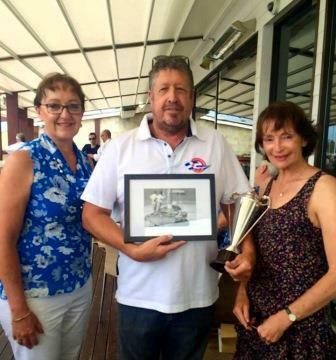 It was pleasure to meet you last Saturday and to hand over our Dad’s sailing trophy and photo to you, from our family. 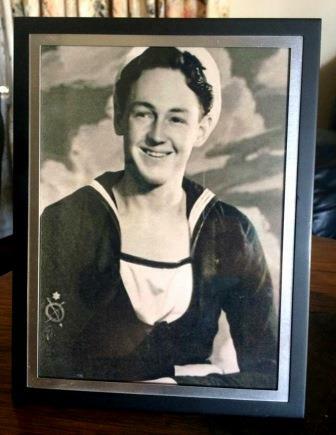 He would always talk so very fondly of his involvement with the Middle Harbour 16ft Skiff Club in his younger years..his love of the ocean followed him, as he joined the Royal Australian Navy to serve in WW11. 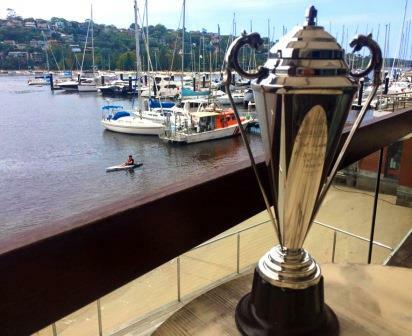 Were were thrilled to hear this trophy will now become a perpetual trophy, to be awarded to the younger sailors at your Club. It was a very special day to celebrate the life of my Uncle John and be where my Dad and Uncle spent many wonderful days together on the waters of Middle Harbour. Your staff were very caring and such a perfect place to share this day with family and friends. I wished I lived in Sydney again, as I would love to become a Member. I have attached four photos for you and the second to last photo of their boat, “Alarm 11” was taken from the original as well, however, without any editing. With our sincere thanks to everyone at your Club, for making our day so very special.